Judy Samida fits Luke and Megan Selle with their skis during Ski for Free at the Crossroads at Big Creek in Sturgeon Bay. Photo by Len Villano. Participate in Ski for Free at Crossroads at Big Creek on Feb. 23, 9:30 am – 3:30 pm; and Feb. 24, 1-3:30 pm. 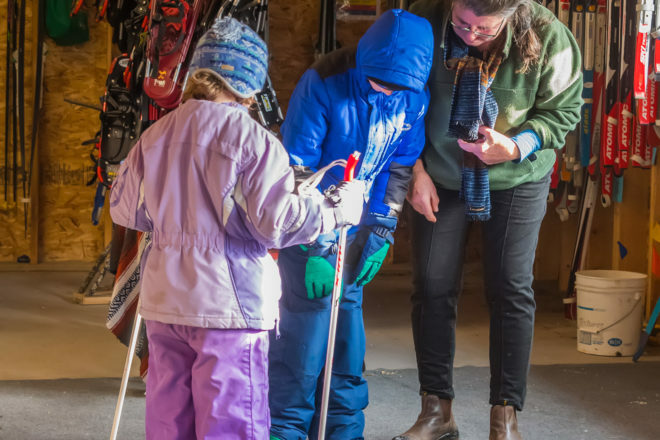 The program lends, free of charge, an array of ski and snowshoe equipment. When trail conditions permit skiing, volunteers in the Crossroads Maintenance Building will fit you with equipment. On Feb. 23, 10 am, enjoy the family program Fit the Bill in the lecture hall and lab of the Collins Learning Center. Learners of all ages will enjoy this hands-on activity, which demonstrates the relationship between the shape of a bird’s bill and the food it eats. Then at 2 pm in the Collins Learning Center’s lecture hall, check out the illustrated lecture “Northern Cardinals,” which will cover the life cycle and seasonal behaviors of the popular red birds. The Door County Beekeepers Club will meet Feb. 26, 6:30 pm, in the lecture hall of the Collins Learning Center. The program will be “Getting Ready for Your Bees,” and the demonstration will be “Building Your Own Forms.” All are welcome. Crossroads is a donor-supported educational center comprising three preserves. The Collins Learning Center, 2041 Michigan St. in Sturgeon Bay, is open 2-4 pm daily and during scheduled events.